You asked for more sweet treats, and we listened. If you love CBD Gummy Bears, it’s time to meet an exciting new member of the Hemp Bombs family. Jolly Bombs have finally arrived, and they offer an incredibly unique way to get your daily dose of CBD. 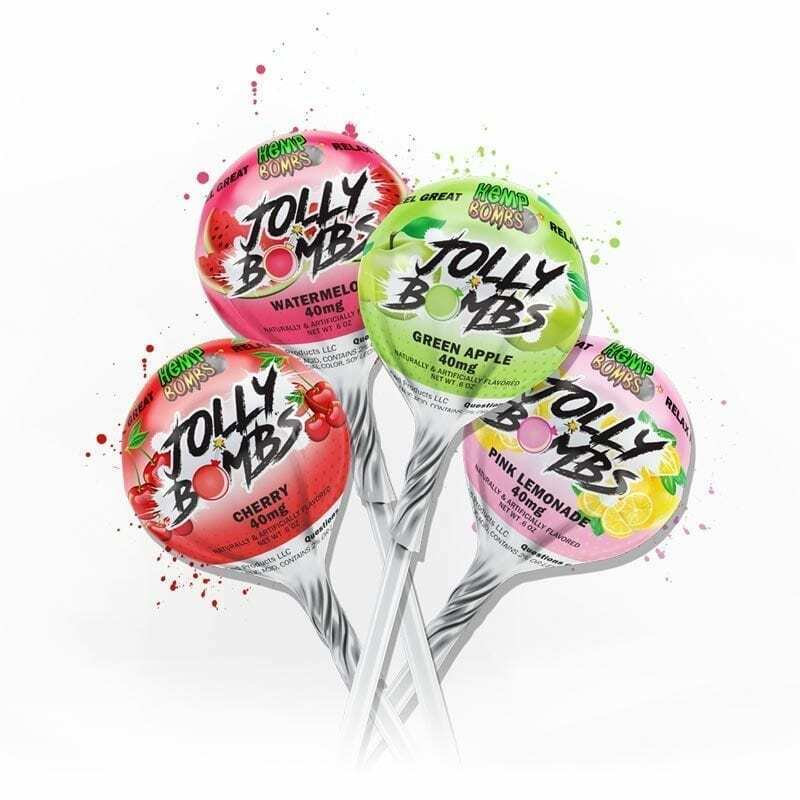 Each Jolly Bombs lollipop contains a whopping 40 milligrams of CBD, which helps you treat yourself while getting one step closer to optimal health and wellness. Available in four delicious flavors — cherry, green apple, pink lemonade and watermelon — Jolly Bombs are the perfect choice for anyone who wants to get creative with their CBD. You don’t have to worry about what you’re putting into your body when you choose Hemp Bombs. Our CBD lollipops are tested by an independent third-party laboratory to ensure purity and CBD potency. How Long Does It Take For CBD Lollipops To Work? Everyone reacts to CBD differently, so there’s no guarantee – but these CBD lollipops are engineered to work quickly and effectively. Dosage needs vary from person to person — if you try a CBD lollipop and don’t feel the desired effects, we recommend trying a high-potency product from Hemp Bombs like CBD Oil. You’ll likely feel the effects of Jolly Bombs within minutes. While CBD and THC are sometimes confused, the two compounds are different in composition and legality. THC is known for getting you “high,” while CBD doesn’t have psychoactive effects. Hemp Bombs products contain zero THC and are legal in all 50 states due to the 2018 Farm Bill. CBD lollipops are legal and won’t cause you to fail a drug test or feel disorienting effects. CBD doesn’t get you high – so what does it do? Instead of causing intoxication, CBD can increase feelings of relaxation and calm. You may find yourself feeling less stressed and more focused. It’s sometimes said to “turn down the dial” on negative feelings and emotions. Rather than feeling the radical difference in mental state that illicit drugs bring, you may slowly notice that you are generally happier and less anxious. It’s hard to believe that a lollipop can actually impact your health, but studies have shown that CBD can have a lasting effect on wellness. CBD is anti-inflammatory, so you may notice a decline in inflammation, swelling and pain. The compound is also associated with sleep regulation, and it may be easier to get shuteye after having a CBD Lollipop. Additionally, CBD may ease the pain caused by headaches and muscle strain to help you feel more comfortable. Who Benefits from CBD Lollipops? It’s impossible to make an exhaustive list of who benefits from CBD lollipops due to their versatility. Even those who aren’t sick or stressed may see surprising improvement in their energy levels, sleep and overall health. CBD isn’t just for those who are unwell — it’s an essential part of anyone’s daily routine. CBD stands for Cannabidiol, and it’s a non-psychoactive compound found in Hemp and Marijuana plants. Hemp Bombs only derives CBD from superior-grade Industrial Hemp grown on American farms. Learn more about CBD and how it works.